The first inter-house English elocution was held on August 19, 2013 evening. This program was initiated by the English department of senior section. The principal focus of holding such event in the school is to boost motivation for speaking English among the students while on the page and off the page. Each house is to send three participants: one for compulsory poetry recitation, second for speech, and third student for dramatic presentation. The house masters have guided their participants in their respective disciplines for effective presentation which becomes a source of inspiration for other students for making English speaking a way of life in the school and getting used to speaking English without much thinking. After the competition, the result was announced and winners were given away prizes by the school principal. 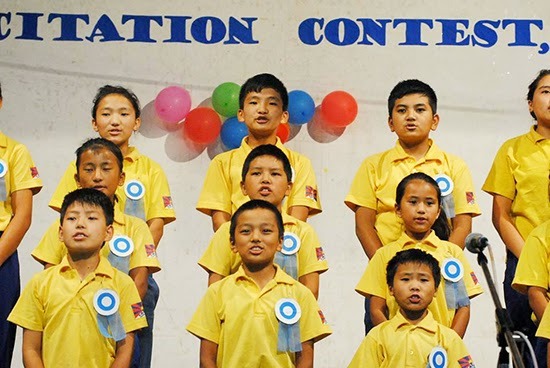 The first round of English elocution contest was won by Triral house, followed by Trisong, Nyatri and Songsten. Among the speakers, Miss. Namdol of VII D was adjudged as the best speaker, and from poetry recitation, Miss. Paldon of VI D was the best reciter, and from dramatic section, we have Master Thinley of V B. It seemed that all the participants came up with their best preparation and it was worth watching and every one present at the program enjoyed the presentation and thus many might have been encouraged and inspired to follow the same path shown by the participants.